Affordable luxury located in historic Lancaster County, PA. Welcome to Ascot House, an historic Lancaster County, PA bed and breakfast decorated in classic Georgian style and located in the pre-civil war town of Marietta, Pennsylvania. This Amish Country bed and breakfast has six spacious and elegant air-conditioned guestroom, luxurious spa-style bathrooms and breakfasts to satisfy any gourmet. 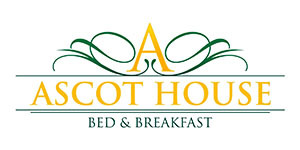 Ascot House is the perfect destination for romantic weekends, girl's getaways, family gatherings, ski and golf adventures, biking, hiking and hot-air ballooning, outlet shopping, antiquing, and exploring Amish Country. With a large dining room, parlor, library and spacious outdoor deck and beautiful English garden, Ascot House is available to host wedding parties for local weddings. When you arrive, a stately entrance welcomes you into the magnificent interior of this elegant example of Federal style architecture (circa 1800). The beautiful hand painted floor in the entrance hall leads you to the graceful central staircase. The kitchen, breakfast, family and laundry rooms were featured in Colonial House Magazine in October 1994. With 17 fireplaces and central air conditioning and heating, this exquisite historic property is a perfect destination at all times of the year.